If you have any questions please call 2482-2400, xt. 2260, which will support it. You can also write to comentarios@aicm.com.mx. Where can I buy a ticket or reserve a flight if I'm at AICM? At the counters of the airlines on which you will be traveling or at travel agencies located inside the airport. Mexican nationals need a visa when traveling to the United States, even if just making a layover there. For other countries, check the Embassy and Consulate section and/or contact the diplomatic office of your country of interest. What documents do I need to travel on a domestic flight? Mexican citizens need a boarding pass and official ID (voter ID, passport, driver’s license). Foreign citizens must have a boarding pass and valid passport. How many hours should I be at the AICM before my flight departure? 2 hours for domestic flights and 3 hours for international flights. What time should I be at the boarding area? 45 minutes before domestic flights and 60 minutes before international flights. You can take baggage with you that will be subject to revision in the X-ray machines located at security checkpoints. Pets are not allowed in the passenger cabins of domestic flights, except for guide dogs, with airline permission. Pets (dogs and cats) can travel in the passenger cabins on international flights, but check the procedures with your airline beforehand. While at the airport, pets must be in containers or hard cages that fit under a seat at all times. Dogs and cats can also be transported in the checked-in baggage cabin. Visit the SAGARPA-SENASICA page beforehand. When traveling with other types of pets, visit the General Directorate of Animal Health, located at Calle Municipio Libre No. 377, Col. Santa Cruz Atoyac, Del. Benito Juárez C.P. 03310, Ciudad de México, or by calling +52 55 59051000 ext. 51037. Where can I pick up a traveler who is arriving on a domestic flight? At Terminal 1, Gate A and A1 or Terminal 2, Gate Q. Where can I pick up a passenger who is arriving on an international flight? At Terminal 1, Gate E1, if the traveler is coming from Central America, South America or the Caribbean; Gate E2 if they are coming from Europe, Asia or Africa; and Gate E3 if they are coming from the United States, Canada or elsewhere. At Terminal 2, Gate P if the traveler is coming from Central America, South America or the Caribbean; and Gate N if they are arriving from the United States, Europe, Asia or Canada. Note: For more information, check flight statuses on electronic displays, or visit any information module. How much time does it take for passengers to deboard a flight? From landing: on domestic flights, from 20 to 50 minutes, and international flights, from 30 to 60 minutes. Where can I pick up a minor? At Terminal 1, Gate A and/or A1, if the flight is domestic; Gate E1 if the flight is from Central America, South America or the Caribbean; Gate E2 if the flight is arriving from Europe, Asia or Africa; and Gate E3 if the flight is from the United States, Canada or elsewhere. At Terminal 2, Gate D if the flight is domestic and Gates E and F for international flights. Note: The minor will be accompanied by an airline representative. Where can I pick up my baggage if it did not arrive on my flight? Immediately after you find out your baggage did not arrive, go to the airline baggage claim counters. For domestic flights, the counters are located next to the carousel where baggage corresponding to your flight is picked up. For international flights, contact the airline representative in charge of checking baggage tickets, which is located next to the carousel where airline staff leaves baggage. Can I park my car on the road outside the terminal building? No. You can only park your car to pick up and drop off people. If you wish to park your car, you can do so at the domestic or international parking lots. Where can I buy a ticket for a taxi ride? At authorized taxi ticket modules, located in Terminal 1 near the domestic flight area, outside gate A and domestic baggage claim area. Near the international flight area in gates E2, E3 and entrance 10. At Terminal 2, domestic flight area, gate D and the international flight area near gate E and entrance 4. Where is the long-distance bus terminal? At Terminal 1 in the international flight area, 1st level, and Terminal 2, at gate 4, next to domestic arrivals. Where can I leave my baggage for a few hours? At baggage storage lockers located near gates A and E2, which offer 24-hour, 365-day-a-year service. For more information, call 58028467 or 57869048. Can I page a person? Yes; at Terminal 1, you can request the service at any information module located in gates A and E of the walkway, and in final boarding areas 19, 26 and 29. You can also request the service in Terminal 2, at the information modules located near gates L2, D and F.
At Terminal 1, outside each gate leading to the airport road, the food court near domestic and international flights, the gate B concentration area food court, gate H, and the first level of building B, next to gate G. At Terminal 2, in the food court area of the departure triangle. Who can use the Aerotrén service? Aerotrén service is for travelers with a boarding pass and/or password (if they have flown), when the flight itinerary, electronic ticket or reservation code has a shared code, in transit or making a connection. Other people who can use the Aerotrén service include children with adults (at least one companion is required), people with disabilities (a companion is required), injured, sick or special care people (a companion is required). What procedures do I need to do to carry ashes and claim a body? To carry ashes, you must show the death certificate and cremation document at security checkpoints. To claim a body, you must call International Health (Sanidad Internacional), at +52 55 55713286 or +52 55 25991100, for Terminal 1, and 25987272 at Terminal 2. If I'm on a trip and my connection is in Mexico, where do I claim my baggage? 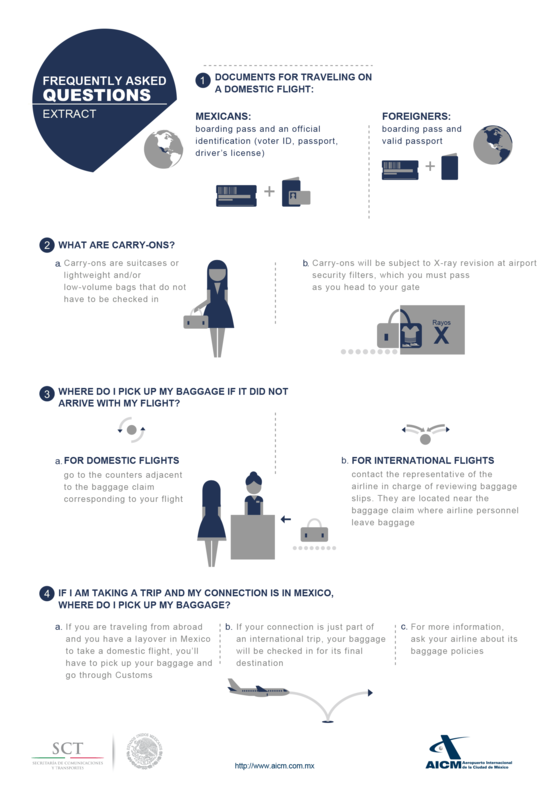 If you’re traveling from abroad and are making a layover in Mexico, to take a domestic flight, you must claim your baggage first before going through Customs. If your layover is only part of an international flight, your baggage will be checked in for your final destination. For more information, ask your airline about its baggage policies.